Childe Hassam (1859–1935), The North Gorge, Appledore, Isles of Shores (1912), oil on canvas, 50.8 × 35.6 cm, Columbus Gallery of Fine Arts, Columbus, OH. Wikimedia Commons. In the first of these two articles to look at paintings of the coast of Maine, I covered the work of nineteenth century artists, ending with Winslow Homer’s works which he made in and around his studio at Prouts Neck, just twenty-five metres/yards from the North Atlantic Ocean. Many of the paintings in this article, covering the twentieth century, were made by one of America’s leading Impressionists, Childe Hassam (1859–1935). Born in Boston, his mother was a Mainer. Hassam returned to New York after he had completed training in Paris, in 1889, and started to spend his summers in the country – often in Maine, and typically on Appledore Island, the largest of the Isles of Shoals, which straddle the border between New Hampshire and Maine. 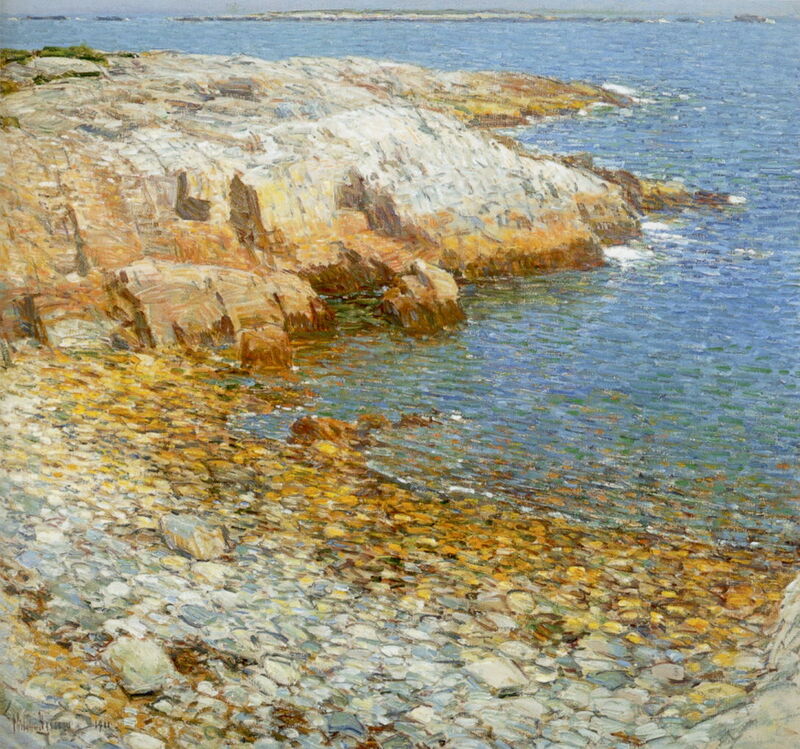 Over the next twenty-five years or so, Hassam painted some of the finest views of this section of the coast of Maine, which also trace his artistic development. Childe Hassam (1859–1935), Celia Thaxter’s Garden, Isles of Shoals, Maine (1890), media and dimensions not known, Metropolitan Museum of Art, New York, NY. Wikimedia Commons. Thomas Laighton and Levi Thaxter were responsible for starting the tourist trade on Appledore Island in the middle of the nineteenth century. When she was only fifteen, Laighton’s daughter Celia married Thaxter, and later became a popular poet, and one of the leading figures on the island. 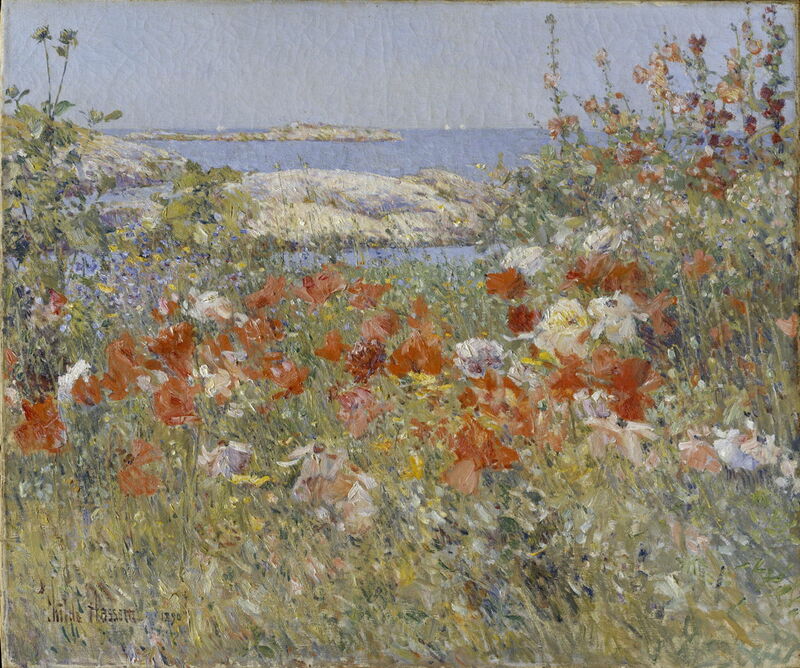 Hassam’s Celia Thaxter’s Garden, Isles of Shoals, Maine (1890) shows the poet’s flower garden in his high Impressionist style, and tells just how idyllic those summers must have been. It is a significant coastal painting in its own right too: during the summer, many coastal areas are rich with the colour of their flowers, which are often confined to coastal zones. Hassam is one of the first artists to celebrate this so fully. 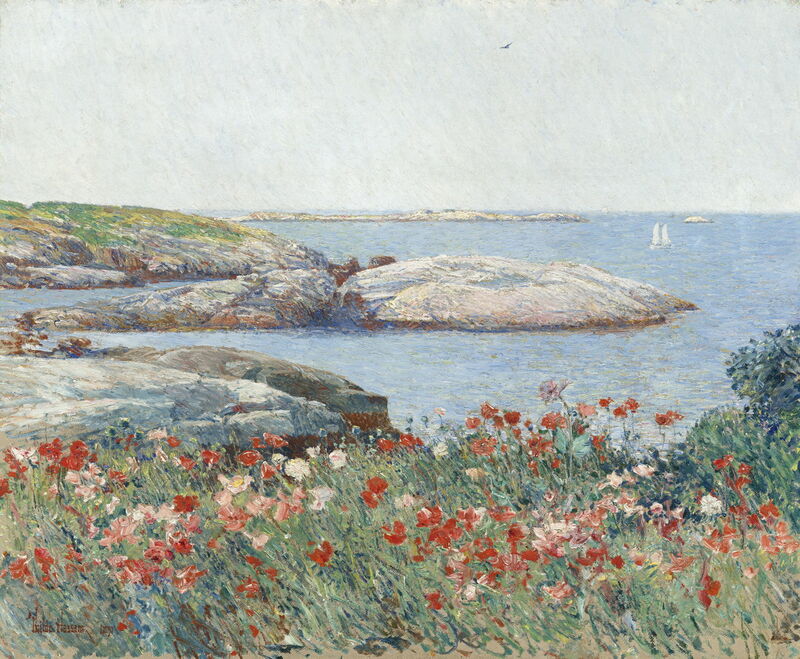 Childe Hassam (1859–1935), Poppies, Isles of Shoals (1891), oil on canvas, 50.2 x 61 cm, National Gallery of Art (Gift of Margaret and Raymond Horowitz), Washington, DC. Courtesy of the National Gallery of Art. The following summer, Hassam moved his easel slightly closer to the water’s edge for his Poppies, Isles of Shoals (1891). This shifts the emphasis from the flowers to the coast. 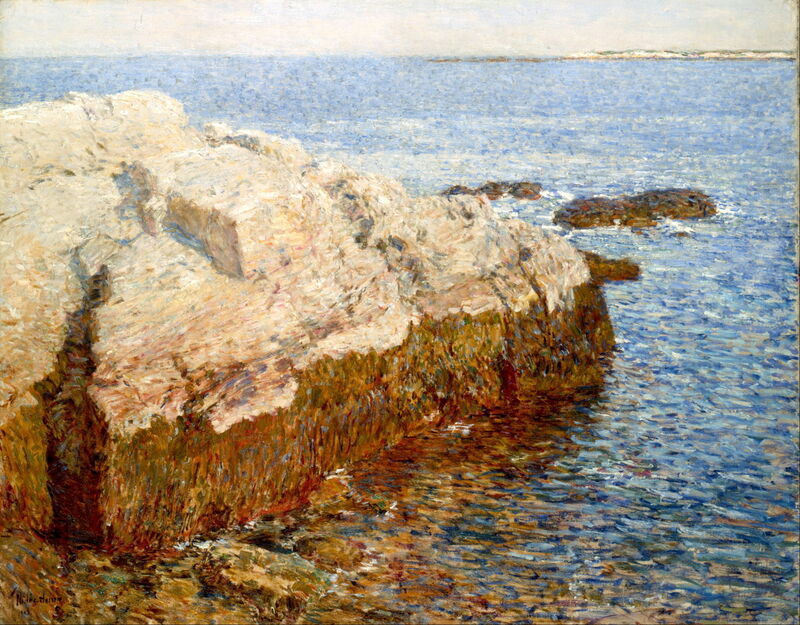 Hassam then spent summers in other locations suited to his Impressionist leaning: Gloucester, MA, and sections of the Connecticut coast. 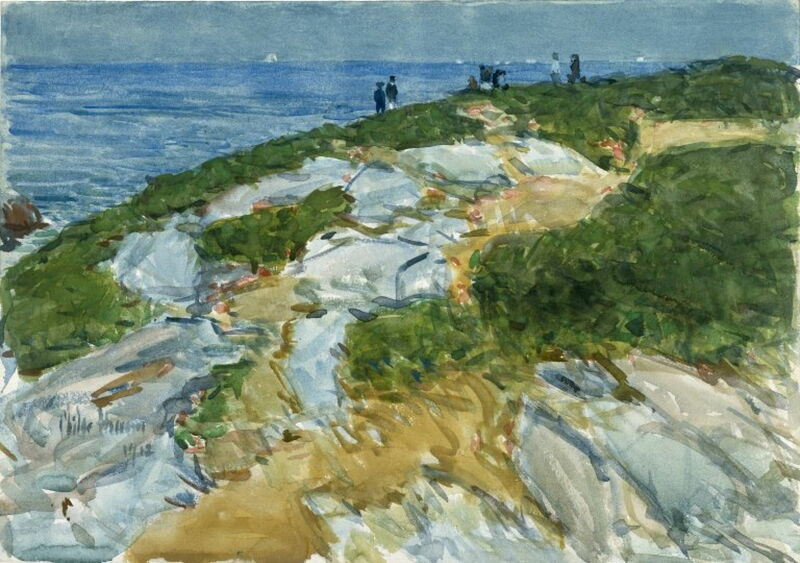 Childe Hassam (1859–1935), Cliff Rock – Appledore (1903), oil on canvas, dimensions not known, Indianapolis Museum of Art, Indianapolis, IN. Wikimedia Commons. He seems to have returned to Appledore Island soon into the new century, when he was finding life in New York was getting him down. His style had evolved and his brushwork and use of fine marks of contrasting colours are more typical of the late Pissarro, perhaps, and have become quite Post-Impressionist in passages. 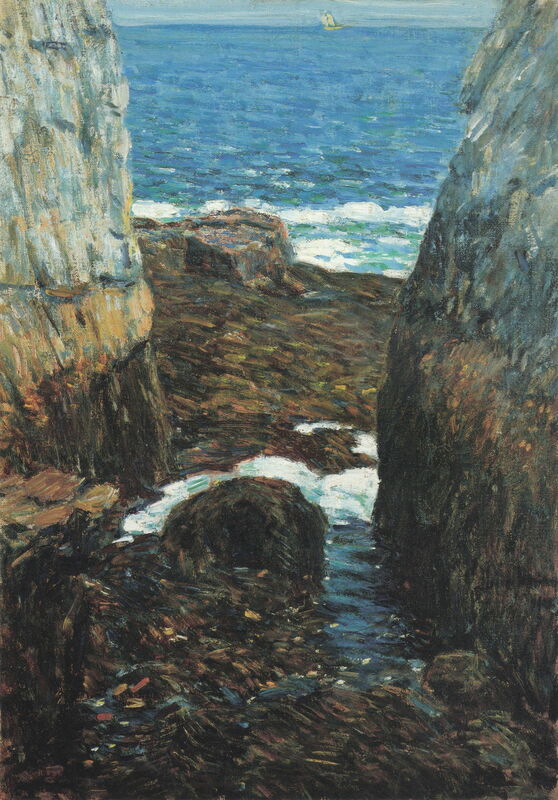 This is shown well in his choice of motif and facture in Cliff Rock – Appledore (1903). 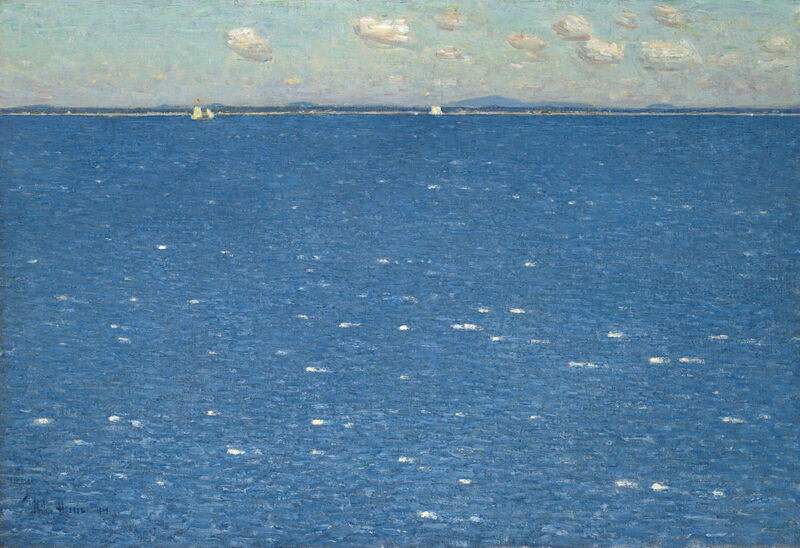 Childe Hassam (1859–1935), The West Wind, Isles of Shoals (1904), oil on canvas, 38.1 × 55.9 cm, Yale University Art Gallery, New Haven, CT. Wikimedia Commons. The following summer, he dispensed with all land apart from a sliver of distant shore, painting just the sea and its white horses in The West Wind, Isles of Shoals (1904). After a bout of depression, and heavy drinking, Hassam reformed himself to an improved lifestyle, and his art went outdoors. He painted extensively in Oregon, including its rugged coast, visited Paris again, and worked with renewed enthusiasm and energy. Childe Hassam (1859–1935), Isles of Shoals, Broad Cove (1911), oil on canvas, dimensions not known, Honolulu Museum of Art, Honolulu, HI. Wikimedia Commons. This took him back to Appledore Island, although his friend Celia Thaxter had died nearly twenty years earlier. Isles of Shoals, Broad Cove (1911) once again shows his use of broken, contrastingly-coloured brushstrokes, and his stark motif. Childe Hassam (1859–1935), Sunday Morning, Appledore (1912), watercolour over graphite on cream, thick, moderately textured wove paper, 35.4 × 50.6 cm, Brooklyn Museum, New York, NY. Wikimedia Commons. Part of Hassam’s rejuvenation was to use a broader range of media, including pastels and watercolours. His Sunday Morning, Appledore (1912) is an example of his very briskly-painted watercolour sketches. Childe Hassam (1859–1935), The Gorge, Appledore (1912), transparent watercolour with touches of opaque watercolour on cream, moderately thick, moderately textured wove paper, 35.1 × 50.5 cm, Brooklyn Museum, New York, NY. Wikimedia Commons. This watercolour sketch of The Gorge, Appledore (1912) shows how differently he depicts the coastal rocks with bolder strokes of transparent colour. Childe Hassam (1859–1935), The North Gorge, Appledore, Isles of Shoals (1912), oil on canvas, 50.8 × 35.6 cm, Columbus Gallery of Fine Arts, Columbus, OH. Wikimedia Commons. When he goes back to oils, though, he reframes completely and returns to what are increasingly organised groups of brushstrokes, as in The North Gorge, Appledore, Isles of Shoals (1912). It is not far from here to Cézanne’s ‘constructive brushstrokes’. Childe Hassam (1859–1935), The South Ledges, Appledore (1913), oil on canvas, 87 × 91.9 cm, Smithsonian American Art Museum, Washington, DC. Wikimedia Commons. The following summer, he was back on Appledore Island, painting outdoors. 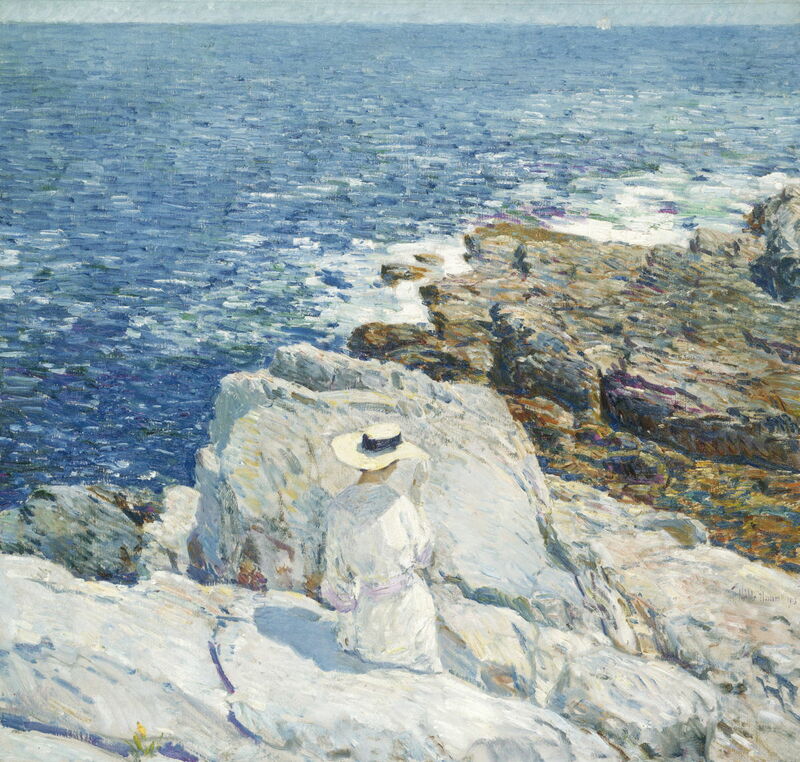 In The South Ledges, Appledore (1913), his placement of a figure in a white dress and hat against near-white rock merges her with her surroundings. A conventional approach would have set her against the darker rock in the distance, or dressed her in different clothing. Childe Hassam (1859–1935), Surf, Isles of Shoals (1913), oil on canvas, 89.5 x 71.8 cm, Metropolitan Museum of Art, New York, NY. Wikimedia Commons. Just as he had in The West Wind, Isles of Shoals from almost a decade earlier, Hassam pushed the land to each side, and in his Surf, Isles of Shoals (1913) concentrated his canvas almost entirely on the sea. 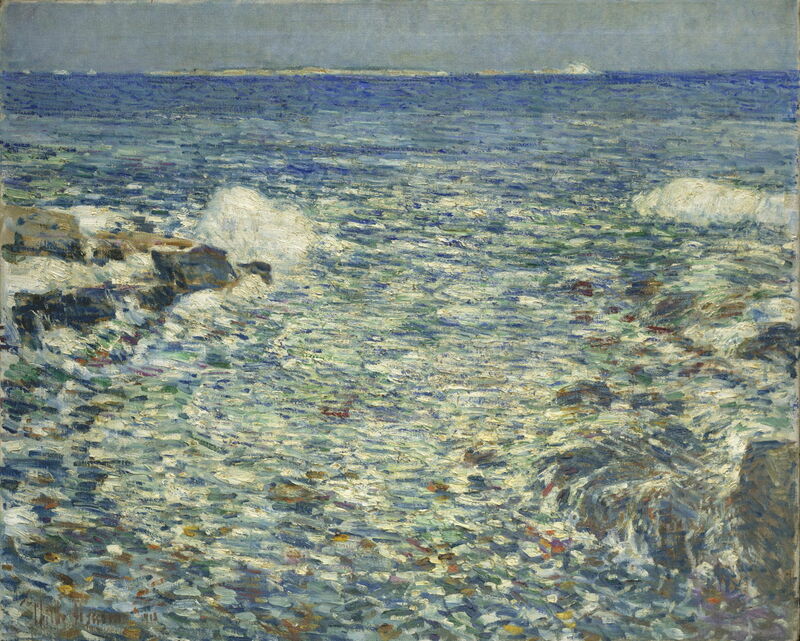 As an Impressionist, it was natural that Hassam was drawn repeatedly to paint the coast of Maine. A more surprising visitor was Robert Henri (1865–1929), leader of the Ashcan school of realism in New York. Having made his reputation with gritty paintings of the urban landscape in New York City, he had the pochade gear and the technique. 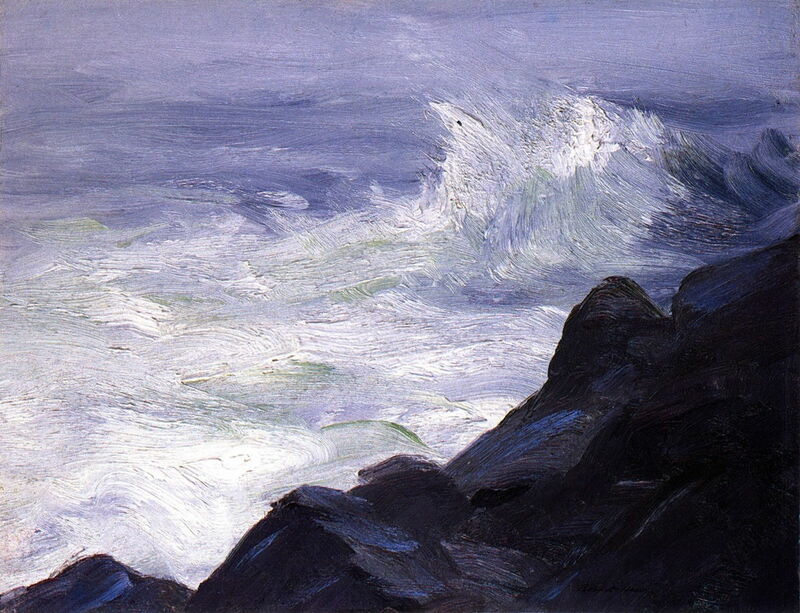 Robert Henri (1865–1929), Marine – Break over Sunken Rock, Storm Sea (1911), oil on panel, 29.2 x 38.1 cm, Portland Museum of Art, Portland, ME. The Athenaeum. Perhaps Henri too needed a break from city life, and in 1911 headed up to paint outdoors in front of the waves rolling in from the Atlantic. 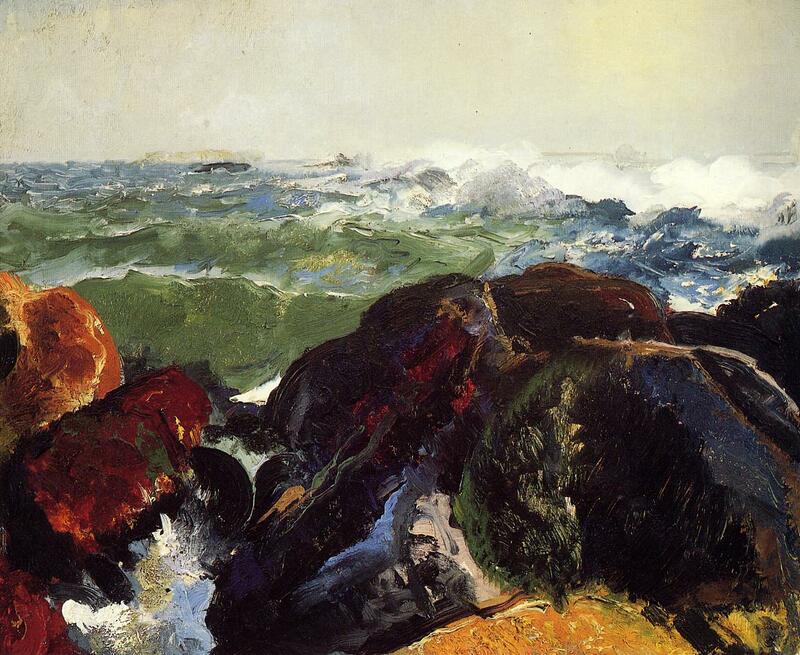 Marine – Break over Sunken Rock, Storm Sea (1911) is an example of what he made in that pochade box. Two years later, Henri crossed the water to Achill Island, on the north-western edge of Ireland, where his painting was inspired. George Bellows (1882–1925) is probably the best-known of Henri’s students. They had both been born in Ohio, and met in New York in 1904. Bellows made similarly rough-hewn cityscapes of New York City, concentrating on its human landscape, and made a remarkable series depicting boxing contests. George Bellows (1882–1925), The Gulls, Monhegan (1911), oil on panel, 28.6 × 38.9 cm, Addison Gallery of American Art, Andover, MA. Wikimedia Commons. 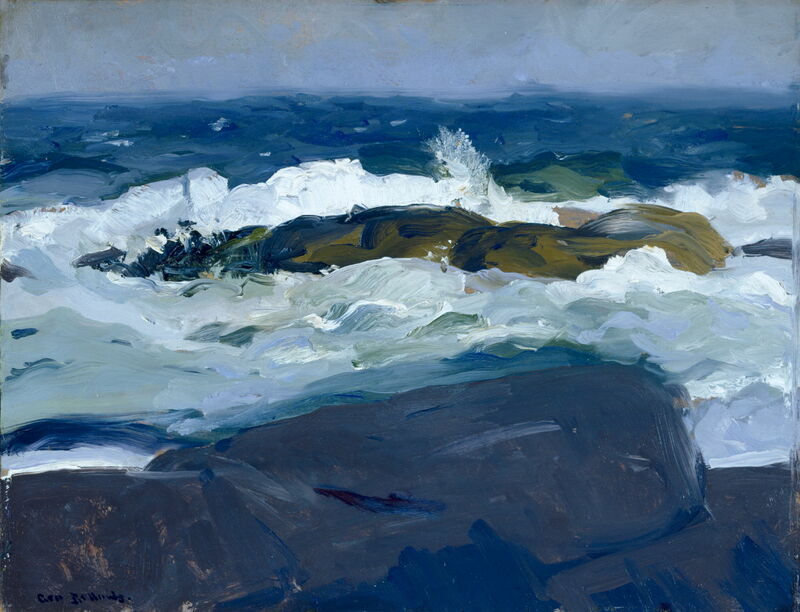 When Robert Henri went to Maine for the summer, George Bellows went to paint on Monhegan, a small and barely populated island about fifteen miles offshore. 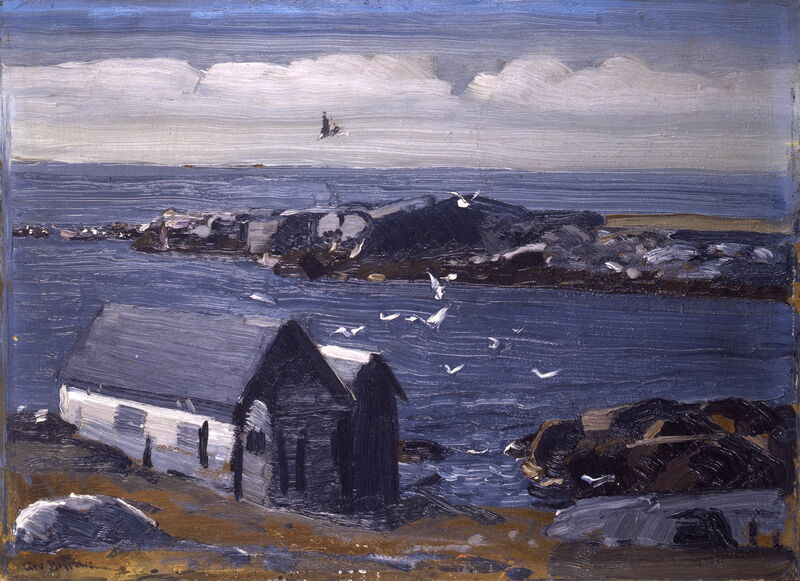 That first summer, one of his pochade panels was The Gulls, Monhegan (1911), its greyness only broken by the brilliant white of the birds. Bellows also visited Matinicus Isle, five miles further out into the Atlantic. George Bellows (1882–1925), Monhegan Island, Maine (1913), oil on panel, 45.7 × 55.9 cm, Worcester Art Museum, Worcester, MA. Wikimedia Commons. 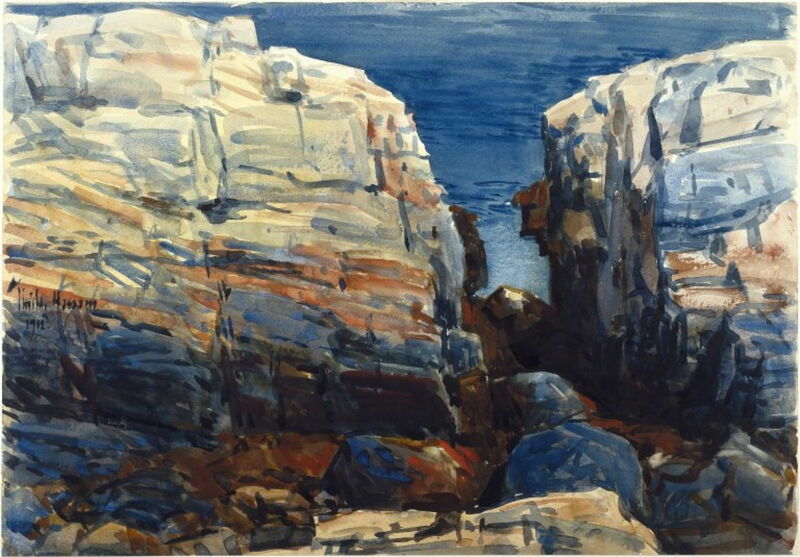 A couple of summers later, his panels became more colourful, capturing the unusual hues of the water and rock, in his Monhegan Island, Maine (1913). George Bellows (1882–1925), The Grove – Monhegan (1913), oil on cardboard, 36.1 × 47.9 cm, Museum of Fine Arts, Houston, TX. Wikimedia Commons. 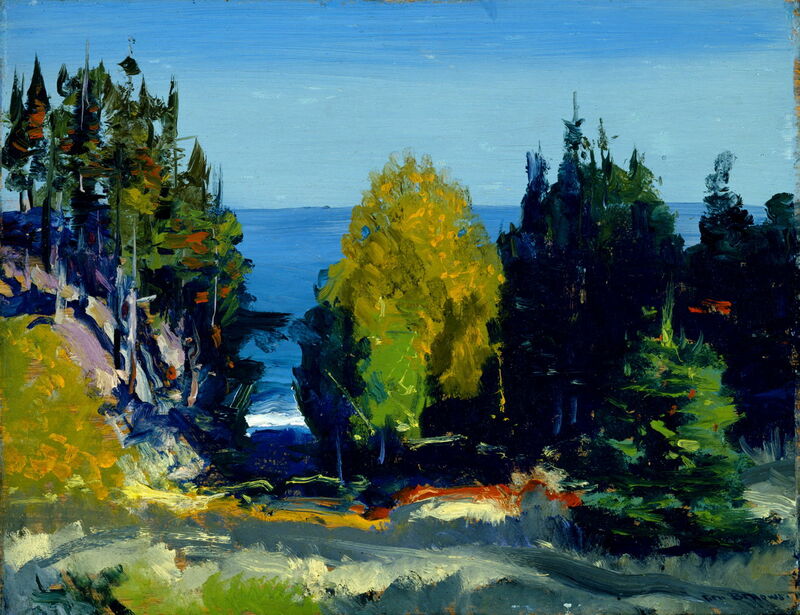 Then, when the sun came out and the weather was set fair, Bellows’ coast burst into brilliant colour, in The Grove – Monhegan (1913). From Thomas Cole and his student Frederic Edwin Church, to Robert Henri and his student George Bellows, paintings of the coast of Maine represent much of the history of American landscape art – at least, that of the East Coast. It’s a coast of great contrasts, of magnificant natural beauty, and the raw power of the ocean and weather. Posted in General, Life, Painting and tagged Bellows, Cézanne, coast, Hassam, Henri, Impressionism, landscape, painting. Bookmark the permalink.